1. See Note A in the Appendix. 2. The reader will find a short account of this engine in the Appendix, Note B. 1+2 = 3. 1+2 + 3 = 6. 1 + 2 + 3 + 4 = 10, &c.
4. It has been supposed that ten turns of the handle of the calculating engine might be made in a minute, or about five hundred and twenty-six millions in a century. 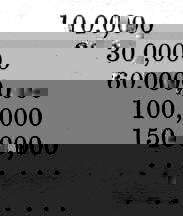 As in this case, each turn would make a calculation, after the lapse of a million of centuries, only the fifteenth place of figures would have been reached. The estimate we form of the intellectual capacity of our race, is founded on an examination of those productions which have resulted from the loftiest flights of individual genius, or from the accumulated labours of generations of men, by whose long-continued exertions a body of science has been raised up, surpassing in its extent the creative powers of any individual, and demanding for its development a length of time, to which no single life extends. The estimate we form of the Creator of the visible world rests ultimately on the same foundation. Conscious that we each of us employ, in our own productions, means intended [30/31] to accomplish the objects at which we aim, and tracing throughout the actions and inventions of our fellow-creatures the same intention,— judging also of their capacity by the fit selection they make of the means by which they work, we are irresistibly led, when we contemplate the natural world, to attempt to trace each existing fact presented to our senses to some precontrived arrangement, itself perhaps the consequence of a yet more general law; and where the most powerful aids by which we can assist our limited faculties fail in enabling us to detect such connexions, we still, and not the less, believe that a more extended inquiry, or higher powers, would enable us to discover them. To illustrate the distinction between a system to which the restoring hand of its [32/33] contriver is applied, either frequently or at distant intervals, and one which had received at its first formation the impress of the will of its author, foreseeing the varied but yet necessary laws of its action throughout the whole of its existence, we must have recourse to some machine, the produce of human skill. But far as all such engines must ever be placed at an immeasurable interval below the simplest of Nature's works, yet, from the vastness of those cycles which even human contrivance in some cases unfolds to our view, we may perhaps be enabled to form a faint estimate of the magnitude of that lowest step in the chain of reasoning, which leads us up to Nature's God. The illustration which I shall here employ will be derived from the results afforded by the Calculating Engine;2 and this I am the more disposed to use, because my own views respecting the extent of the laws of Nature [33/34] were greatly enlarged by considering it, and also because it incidentally presents matter for reflection on the subject of inductive reasoning. Nor will any difficulty arise from the complexity of that engine; no knowledge of its mechanism, nor any acquaintance with mathematical science, are necessary for comprehending the illustration; it being sufficient merely to conceive that computations of great complexity can be effected by mechanical means. being, in fact, the series of triangular numbers,3 each multiplied by 10,000. [37/38] If we still continue to observe the numbers presented by the wheel, we shall find, that for a hundred, or even for a thousand terms, they continue to follow the new law relating to the triangular numbers; but after watching them for 2761 terms, we find that this law fails in the case of the 2762d term. If we continue to observe, we shall discover another law then coming into action, which also is dependent, but in a different manner, on triangular numbers. This will continue through about 1430 terms, when a new law is again introduced, which extends over about 950 terms; and this too, like all its predecessors, fails, and gives place to other laws, which appear at different intervals. 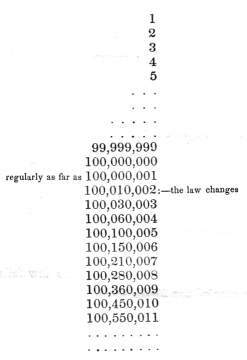 Now it must be remarked, that the law that each number presented by the Engine is greater by unity than the preceding number, which law the observer had deduced from an induction of a hundred million instances) was [38/39] not the true law that regulated its action; and that the occurrence of the number 100,010,002 at the 100,000,002d term, was as necessary a consequence of the original adjustment, and might have been as fully foreknown at the commencement, as was the regular succession of any one of the intermediate numbers to its immediate antecedent. The same remark applies to the next apparent deviation from the new law, which was founded on an induction of 2761 terms, and to all the succeeding laws; with this limitation only—that whilst their consecutive introduction at various definite intervals is a necessary consequence of the mechanical structure of the engine, our knowledge of analysis does not yet enable us to predict the periods at which the more distant laws will be introduced. If we continue to observe, we shall discover another law then coming into a Such are some of the facts which, by a certain adjustment of the Calculating Engine, would be presented to the observer. Now, let him imagine another engine, offering to the [39/40] eye precisely the same figures in the same order of succession; but let it be necessary for the maker of that other engine, previously to each apparent change in the law, to make some new adjustment in the structure of the engine itself, in order to accomplish the ends proposed. The first engine must be susceptible of having embodied in its mechanical structure, that more general law of which all the observed laws were but isolated portions,—a law so complicated, that analysis itself, in its present state, can scarcely grasp the whole question. The second engine might be of far simpler contrivance; it must be capable of receiving the laws impressed upon it from without, but is incapable, by its own intrinsic structure, of changing, at definite periods, and in unlimited succession, those laws by which it acts. Which of these two engines would, in the reader's opinion, give the higher proof of skill in the contriver? He cannot for a moment hesitate in pronouncing that that for which, after its original adjustment, no [40/41] superintendance is required, displays far greater ingenuity than that which demands, at every change in its law, the direct intervention of its contriver. Thus a series of laws, each simple in itself, successively spring into existence, at distances almost too great for human conception. The full expression of that wider law, which comprehends within it this unlimited sequence of minor consequences, may indeed be beyond the utmost reach of mathematical analysis: [42/43] but of one remarkable fact, however, we are certain—that the mechanism brought into action for the purpose of changing the nature of the calculation from the production of the merest elementary operations into those highly complicated ones of which we speak, is itself of the simplest kind. In contemplating the operations of laws so uniform during such immense periods, and then changing so completely their apparent nature, whilst the alterations are in fact only the necessary consequences of some far higher law, we can scarcely avoid remarking the analogy which they bear to several of the phenomena of nature. The laws of animal life which regulate the caterpillar, seem totally distinct from those which, in the subsequent stage of its existence, govern the butterfly. The difference is still more remarkable in the transformations undergone by that class of animals which spend the first portion of their life beneath the [43/44] surface of the waters, and the latter part as inhabitants of air. It is true that the periods during which these laws continue to act are not, to our senses, enormous, like the mechanical ones above mentioned; but it cannot be doubted that, immeasurably more complex as they are, they were equally foreknown by their Author: and that the first creation of the egg of the moth, or the libellula, involved within its contrivance, as a necessary consequence, the whole of the subsequent transformations of every individual of their respective races. In turning our views from these simple results of the juxtaposition of a few wheels, it is impossible not to perceive the parallel reasoning, which may be applied to the mighty and far more complex phenomena of nature. To call into existence all the variety of vegetable forms, as they become fitted to exist, by the successive adaptations of their parent earth, is undoubtedly a high exertion of creative power. When a rich vegetation has [44/45] covered the globe, to create animals adapted to that clothing, which, deriving nourishment from its luxuriance, shall gladden the face of nature, is not only a high but a benevolent exertion of creative power. To change, from time to time, after lengthened periods, the races which exist, as altered physical circumstances may render their abode more or less congenial to their habits, by allowing the natural extinction of some races, and supplying by a new creation others more fitted to occupy the place previously abandoned, is still but the exercise of the same benevolent power. To cause an alteration in those physical circumstances,—to add to the comforts of the newly-created animals,—all these acts imply power of the same order, a perpetual and benevolent superintendence, to take advantage of altered circumstances, for the purpose of producing additional happiness. The vast cycles in the geological changes that have taken place in the earth's surface., of which we have ample evidence, offer another analogy in nature to those mechanical changes of law from which we have endeavoured to extract a unit sufficiently large to serve as an imperfect measure for some of the simplest works of the Creator. The gradual advance of Geology, during the last twenty years, to the dignity of a science, has arisen from the laborious and extensive collection of facts, and from the enlightened spirit in which the inductions founded on those facts have been deduced and discussed. To those who are unacquainted with this science, or indeed to any person not deeply versed in the history of this and kindred subjects, it is impossible to convey a just impression of the nature of that evidence by which a multitude of its conclusions are supported:—evidence in many cases so irresistible, that the records of the past ages, to which it refers, are traced [47/48] in language more imperishable than that of the historian of any human transactions ; the relics of those beings, entombed in the strata which myriads of centuries have heaped upon their graves, giving a present evidence of their past existence, with which no human testimony can compete. It is found that each additional step, in the grouping together of the facts of geology, confirms the view that the changes of our planet, since it has been the abode of man, is but as a page in the massive volumes of its history, every leaf of which, written in the same character, conveys to the decypherer the idea of a succession of the same causes acting with varying intensity, through unequal but enormous periods, each period apparently distinguished by the coming in or going out of new subsidiary laws, yet all submitted to some still higher condition, which has stamped the mark of unity on the series, and points to the conclusion that the minutest changes,  as well as those transitions apparently the most abrupt, have been throughout all time the necessary, the inevitable consequences of some more comprehensive law impressed on matter at the dawn of its existence.